Gamma rays are the most energetic type of light, packing a punch strong enough to pierce through metal or concrete barriers. More energetic than X-rays, they are born in the chaos of exploding stars, the annihilation of electrons and the decay of radioactive atoms. And today, medical scientists have a fine enough control of them to use them for surgery. Here are seven amazing facts about these powerful photons. Gamma rays can be helpful as well as harmful (and are very unlikely to turn you into the Hulk). 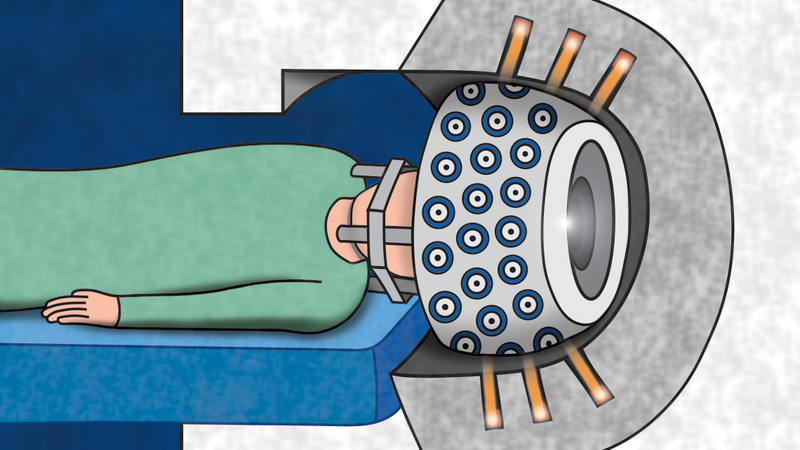 To destroy brain cancers and other problems, medical scientists sometimes use a "gamma ray knife." This consists of many beams of gamma rays focused on the cells that need to be destroyed. Because each beam is relatively small, it does little damage to healthy brain tissue. But where they are focused, the amount of radiation is intense enough to kill the cancer cells. Since brains are delicate, the gamma ray knife is a relatively safe way to do certain kinds of surgery that would be a challenge with ordinary scalpels. The name “gamma rays” came from Ernest Rutherford. French chemist Paul Villard first identified gamma rays in 1900 from the element radium, which had been isolated by Marie and Pierre Curie just two years before. When scientists first studied how atomic nuclei changed form, they identified three types of radiation based on how far they penetrated into a barrier made of lead. 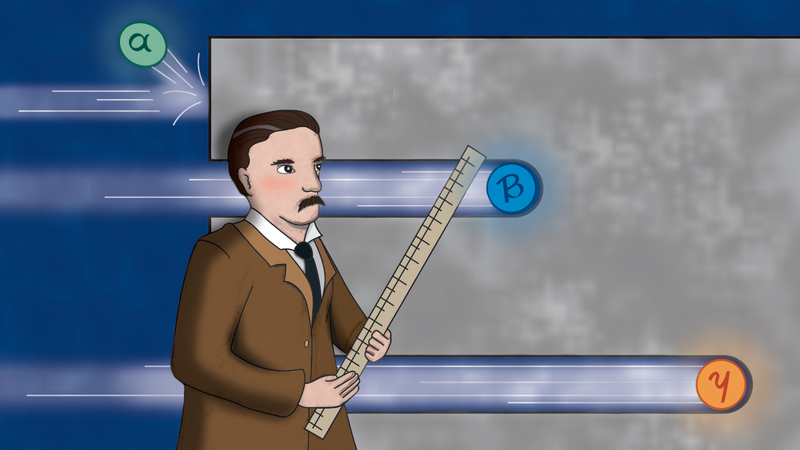 Ernest Rutherford named the radiation for the first three letters of the Greek alphabet. Alpha rays bounce right off, beta rays went a little farther, and gamma rays went the farthest. Today we know alpha rays are the same thing as helium nuclei (two protons and two neutrons), beta rays are either electrons or positrons (their antimatter versions), and gamma rays are a kind of light. Nuclear reactions are a major source of gamma rays. When an unstable uranium nucleus splits in the process of nuclear fission, it releases a lot of gamma rays in the process. Fission is used in both nuclear reactors and nuclear warheads. To monitor nuclear tests in the 1960s, the United States launched gamma radiation detectors on satellites. They found far more explosions than they expected to see. Astronomers eventually realized these explosions were coming from deep space—not the Soviet Union—and named them gamma-ray bursts, or GRBs. Today we know GRBs come in two types: the explosions of extremely massive stars, which pump out gamma rays as they die, and collisions between highly dense relics of stars called neutron stars and something else, probably another neutron star or a black hole. Gamma rays played a key role in the discovery of the Higgs boson. Most of the particles in the Standard Model of particle physics are unstable; they decay into other particles almost as soon as they come into existence. The Higgs boson, for example, can decay into many different types of particles, including gamma rays. 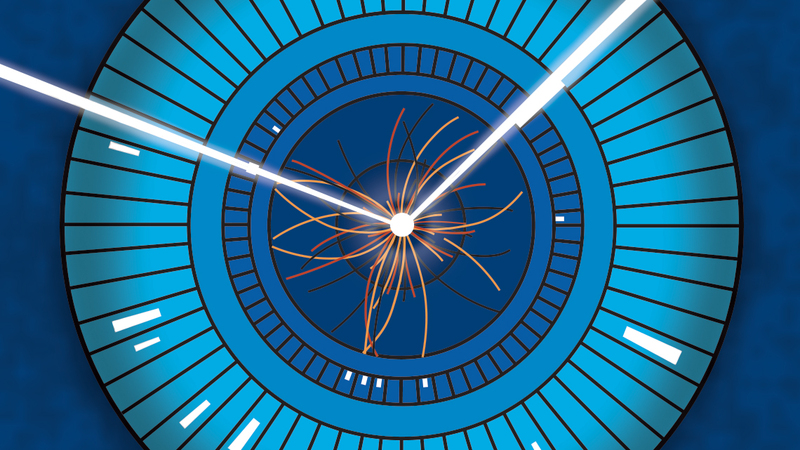 Even though theory predicts that a Higgs boson will decay into gamma rays just 0.2 percent of the time, this type of decay is relatively easy to identify and it was one of the types that scientists observed when they first discovered the Higgs boson. 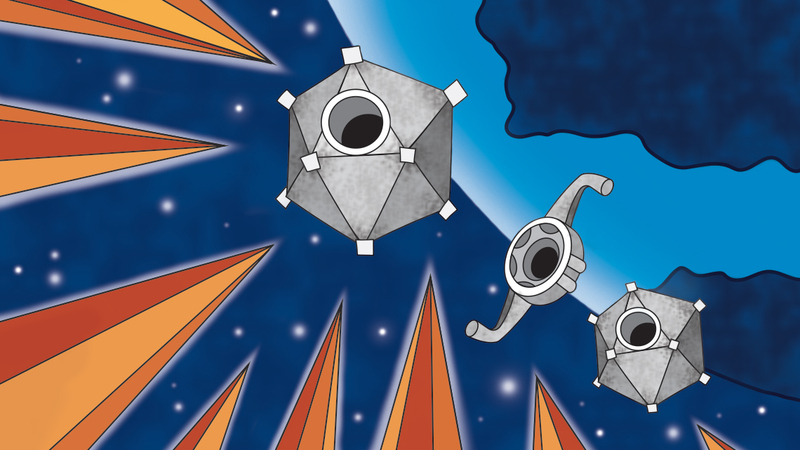 To study gamma rays, astronomers build telescopes in space. Gamma rays heading toward the Earth from space interact with enough atoms in the atmosphere that almost none of them reach the surface of the planet. That's good for our health, but not so great for those who want to study GRBs and other sources of gamma rays. 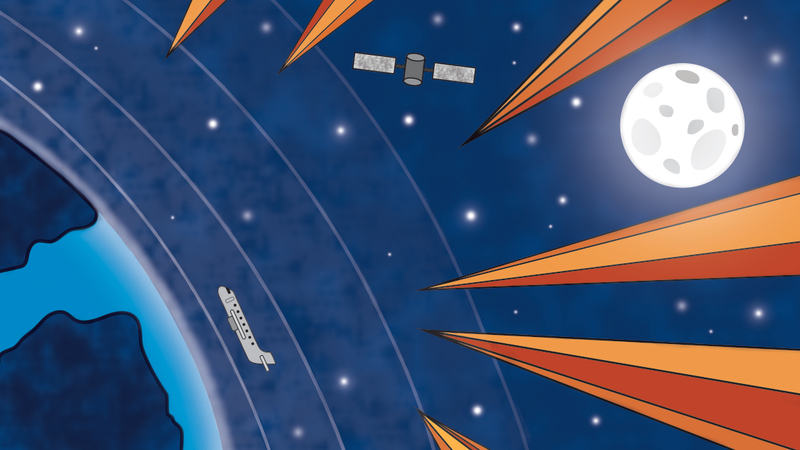 To see gamma rays before they reach the atmosphere, astronomers have to build telescopes in space. This is challenging for a number of reasons. For example, you can't use a normal lens or mirror to focus gamma rays, because the rays punch right through them. Instead an observatory like the Fermi Gamma-ray Space Telescope detects the signal from gamma rays when they hit a detector and convert into pairs of electrons and positrons. Some gamma rays come from thunderstorms. In the 1990s, observatories in space detected bursts of gamma rays coming from Earth that eventually were traced to thunderclouds. 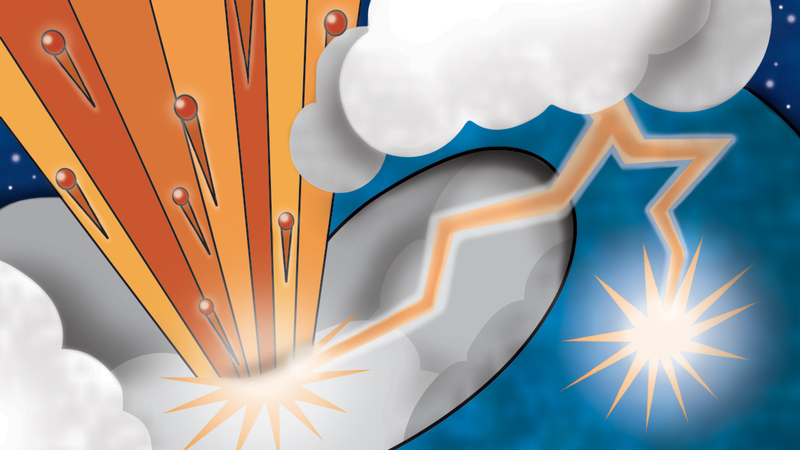 When static electricity builds up inside clouds, the immediate result is lightning. That static electricity also acts like a giant particle accelerator, creating pairs of electrons and positrons, which then annihilate into gamma rays. These bursts happen high enough in the air that only airplanes are exposed—and they’re one reason for flights to steer well away from storms. Gamma rays (indirectly) give life to Earth. Hydrogen nuclei are always fusing together in the core of the sun. When this happens, one byproduct is gamma rays. The energy of the gamma rays keeps the sun’s core hot. Some of those gamma rays also escape into the sun's outer layers, where they collide with electrons and protons and lose energy. As they lose energy, they change into ultraviolet, infrared and visible light. 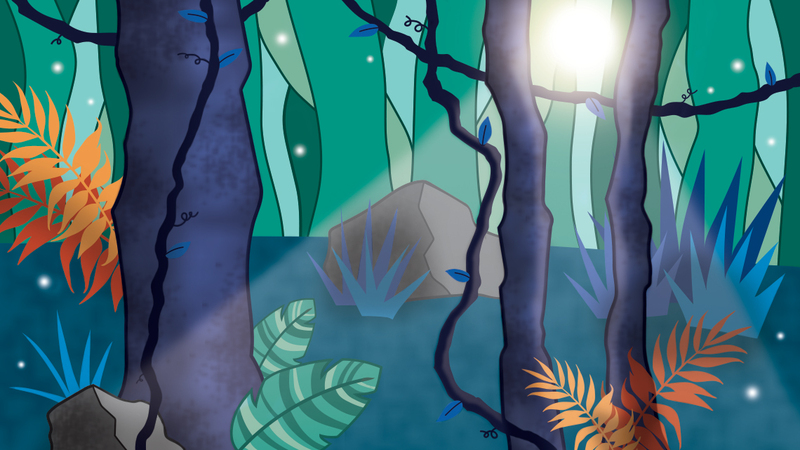 The infrared light keeps Earth warm, and the visible light sustains Earth’s plants.